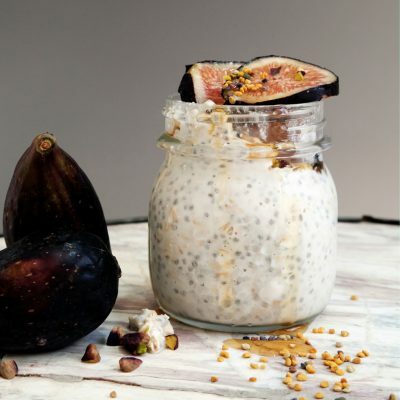 In a small jar add almond milk, chia seeds and vanilla. Mix with a spoon. Add oats and mix a few times to ensure that oats are completely covered by the almond milk mixture. Cover with a lid and refrigerate overnight. The next morning, top with 2 sliced figs and 1 teaspoon of bee pollen. Diggin' these recipes? Sign up for updates - It's free!